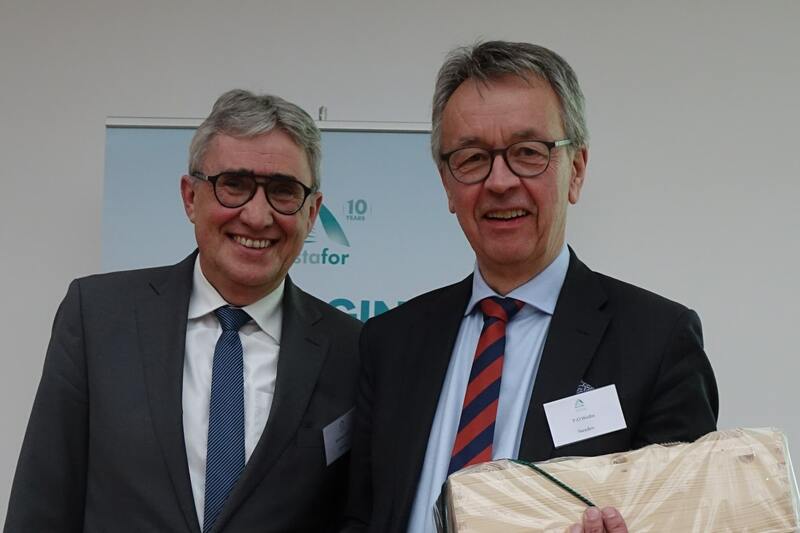 Reinhardt Neft, Managing Director of Bayerische Staatsforsten AöR, has been elected as the new President of EUSTAFOR. In addition to electing the members of the Executive Committee, EUSTAFOR’s General Assembly, held on 12 March 2019 in Brussels, also decided on the association’s Strategy for the coming 3 years. The new Strategy identifies relevant ways in which EUSTAFOR can effectively contribute to, and cope with, challenging developments in areas such as climate change, the bio- and circular economies, multi-purpose forestry as a provider of income, social benefits and ecosystem services, and biodiversity (including the management of protected areas). “On behalf of EUSTAFOR, I would like to thank Per-Olof Wedin for his great effort on sustainable forestry in Europe during his presidency,” says Reinhardt Neft. “In my opinion, an important strength of EUSTAFOR is that we offer a platform which perfectly serves knowledge transfer between EUSTAFOR members. Moreover, one important strategic objective will be to increase communication on international and national level as well as to inform and convince the public that sustainably managed forests serve the economy, ecology and society equally,” says Reinhardt Neft. EUSTAFOR’s members – dynamic and capable entities managing state forests in close to 25 European countries – regularly come together to exchange their knowledge and know-how, not only with each other, but also with other forest-sector stakeholders and EU decision makers. They base their positions on the successful and verified expert practices they have put in place in approximately 1/3 of the European Union’s forest area, including 14 million hectares of protected areas. Their consultative approach allows them to provide relevant, valuable and reliable input to the EU policy development processes. “We are firmly convinced that forestry and sustainable forest management at international and national level play a crucial role on climate change mitigation. EUSTAFOR’s new Strategy will allow us to continue to be a constructive but also authoritative partner in every political process which affects sustainable forestry,” states Reinhardt Neft. Reinhardt Neft replaces Per-Olof Wedin, CEO of Sveaskog (Sweden). Mr. Wedin has stepped down from EUSTAFOR’s presidency, which he held for four years, but will continue to serve on the committee. Further members of the Executive Committee, elected for a term of 2 years, include Metsähallitus (Vice-President – Finland), Lesy České Republiky s.p. (Czech Republic), Office National des Forêts (France), Coillte (Ireland), Lasy Państwowe (Poland), ROMSILVA (Romania) and Riigimetsa Majandamise Keskus (Estonia). Please visit our website at www.eustafor.eu and follow @EUSTAFOR on Twitter. EUSTAFOR was established in 2006. Its members are state forest management organizations from 24 European countries. These organizations practice sustainable forest management in approximately 1/3 of the EU’s forest area, including more than 16 million hectares of designated Natura 2000 sites and other forests protected by law. They harvest approximately 133 million m3 of round timber annually and, together, employ close to 100 000 people.